Positive: Powerful hardware; good connectivity. Negative: Thick frames; mediocre design. Positive: Nice gaming performance; decent hardware; good price. Negative: Relatively heavy. Positive: Large screen; great built quality; powerful processor; nice display. Positive: Solid workmanship; comfortable keyboard; good speakers; good cooling and silent system; nice display. Negative: Mediocre touchpad. Positive: Excellent display; high performance; good cooling system; comfortable keyboard; powerful processor. Positive: Good price; nice design; decent performance. Negative: Heavy; short battery life; overheats while using. Positive: Powerful hardware; nice gaming performance; good display. Positive: High performance; low price; nice display; powerful hardware; good silent and cooling system. Negative: Mediocre design; heavy. The Acer Predator Helios 300 is a classic gaming laptop that takes the form of both a 15.6-inch and 17.3-inch laptop. As Acer expands its Predator gaming lineup for the second half of 2017, the company continues to focus on thermal technology to push the limits of gaming hardware. Shipping with Windows 10, the Predator Helios 300 offers high-end gaming features and technologies at mid-range price points. 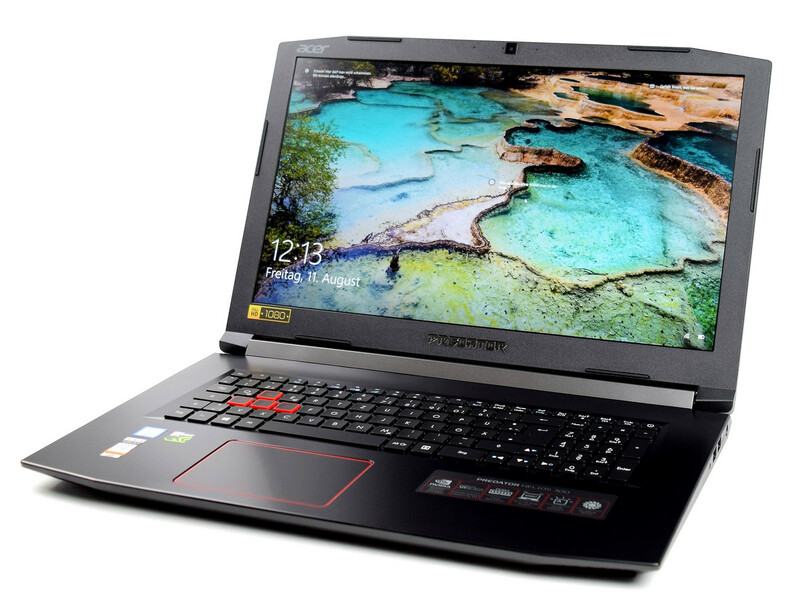 Acer’s new AeroBlade 3D fans and a new Corning Gorilla-Glass touchpad design were introduced with the new Predator Triton ultra-thin gaming notebook series and the more affordable Predator Helios notebooks. The large Corning Gorilla-Glass plate above the keyboard serves two functions: It’s a decorative window into the notebook’s cooling system, showcasing the AeroBlade 3D Fan and five heat pipes; but the glass surface also functions as a touchpad. Acer went with a different choice in materials: brushed metal for the lid cover and the interior, and rough plastic for the sides and the underbelly. Its matte black chassis incorporates more stylized red accents compared to the more “serious” design of the Triton 700. Its exterior is mostly black, but with sharp bevelled edges and quite a few red accents and embossed logos. There’s a big Predator logo on the lid, flanked by two red bars, but neither is backlit. Aesthetically, the black metallic surfaces are prone to smudges and finger oil, so users will have to wipe them often. In terms of build quality, the Helios 300 is fairly well made with a strong inner deck. The display can lean back up to around 150 degrees and the hinges can keep it sturdily set up in any intermediate position. At the heart of the Predator Helios 300 is an overclockable Nvidia GeForce GTX 1060 or 1050Ti GPU combined with a 7th-Gen Intel Core i7 (7700HQ) or i5 processor (7300HQ) for outstanding performance. All this processing power is supported by up to 16GB of DDR4 memory (upgradable to 32GB), a speedy SATA SSD and a 1TB HDD. In addition, access compartment doors on the bottom of the notebooks make it easy for owners to upgrade the memory and storage components. Another feature to mention is the webcam. It’s placed on top of the screen, flanked by two microphones and a LED that signals when it’s on. It has a wide-angle lens, but the image quality is grainy and washed out. The Predator Helios 300 also includes a USB 3.1 Type-C port, a USB 3.0 port (featuring power-off USB charging), two USB 2.0 ports, and an HDMI 2.0 connection. This laptop is suitable for casual gamers who also require something more practical.